Jeanette Iris Herringbone stemmed cocktail goblet 4.5"
Jeannette glass, IRIS and HERRINGBONE Pattern crystal clear stemmed cocktail goblet. About 4 1/2 inches high. Excellent condition. Right now I just have one. 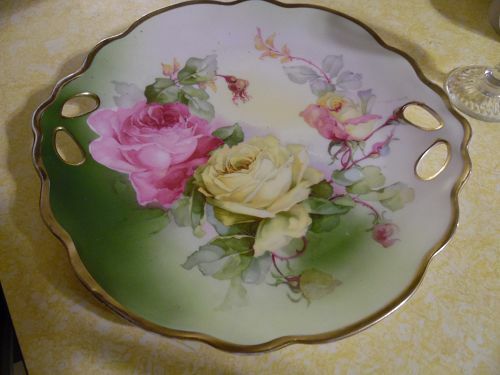 Lovely cake plate decoated with roses and gold trim. Open handles.Circa: 1895 - 1937 Bavaria German. Green backstamp Prince Regent Bavaria. Fine porcelain 10"" inch diameter excellent condition. 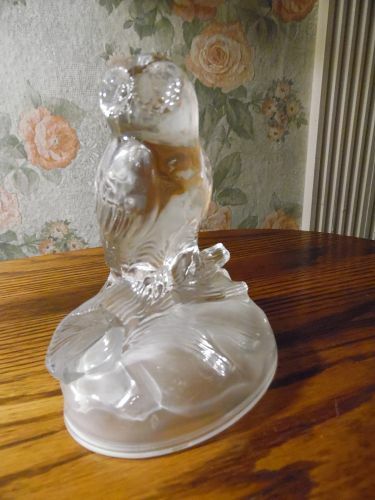 Crystal owl Figurine on frosted glass base Cristal d'Arques Clear Glass wildlife Cabin Decor Cristal D'Arques France, Lead Crystal. Frosted, Hollow Glass Base Measures 6" tall, 4 3/4" wide. This company makes many different figurines but Hard to find this one. Perfect condition but no box. Please send zip code when inquiring or purchasing so I can give an accurate shipping. 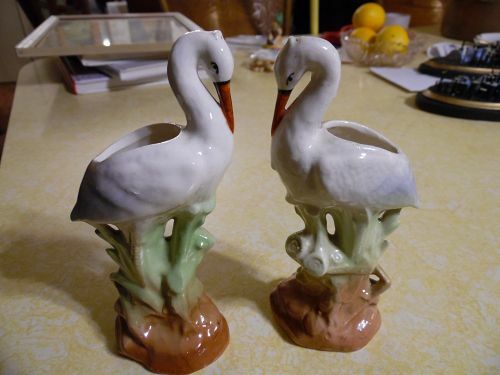 Very old stork vases made in Czechoslovakia. I have two as pictured, and both are in excellent condition. Soft green and brown muted colors. Measures 6 1/8" tall. Priced individually, but if you would like to purchase as a pair, I will credit you 5.00 off at checkout. 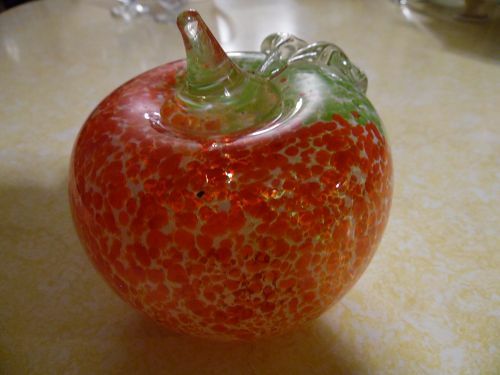 Large 4" height and diameter, spatter glass apple. Use as a paperweight or just for a pretty display. Perfect condition with felt on the bottom. This appears to be hollow but is still heavy. I see no name or sticker but it could be under the felt. Excellent condition with no damages or nicks. A lovely hand painted porcelain basket by C D Korehge. Stamped Bavaria, and the hand painted artists signature. 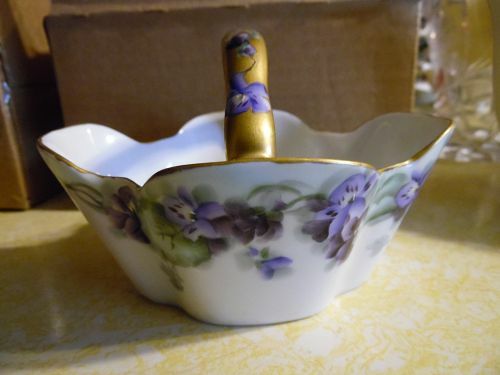 Hand painted with lovely violets and gold. Measures 3 1/4" tall to the tip of the handle. Diameter is 3 3/4" by 5 1/4". Perfect condition with no damages or wear. An awesome addition to your collection. 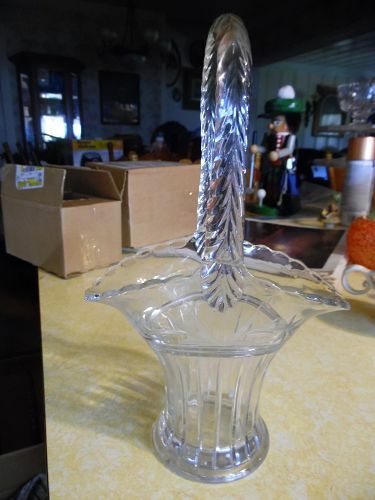 Lovely antique Duncan Measures 10" to the top of the handle.n Miller glass flower basket with flower cutting and pressed leaves and stem. Star bottom.Absolutely lovely with no chips cracks or repairs. In an old advertisement this was known as basket #38. Fostoria Baroque shape, plain with no decoration. This is the individual creamer. Excellent condition with no issues. Baroque shape 3" tall. 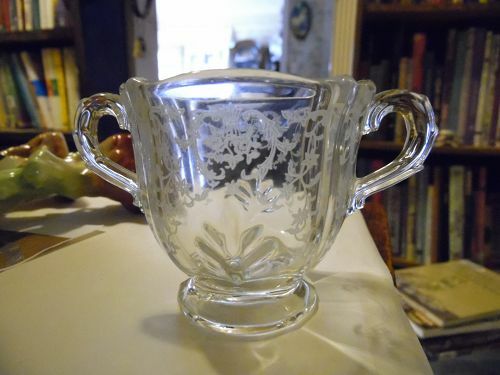 Adorable individual sugar bowl in Fostoria's Navarre etching #327. Baroque shape #327. 2 7/8" tall, and is in pristine condition. 2496/687. 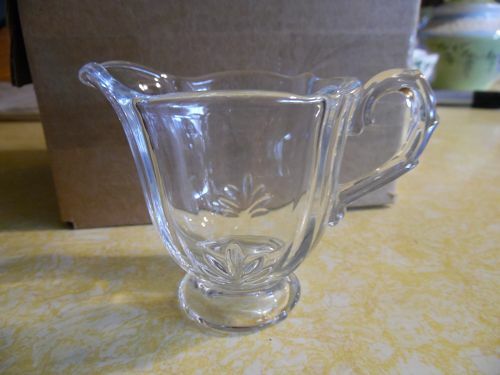 Lovely Fostoria individual size demitasse creamer and matching sugar. Century shape with the #833 Bridal wreath cutting.Made of Rock Crystal 1960-1965. Both pieces are pristine. Height is 3 3/8" tall. Adorable vintage childs cup or mug. 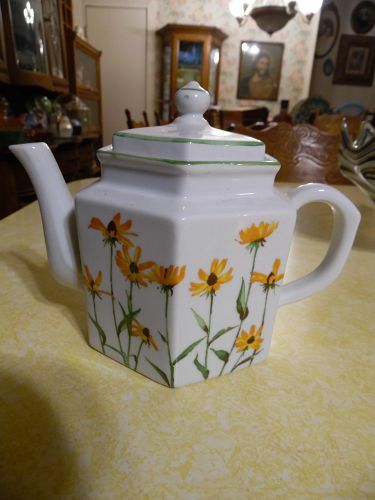 Measures 3 3/4" tall and has an opening of 3 7/8". 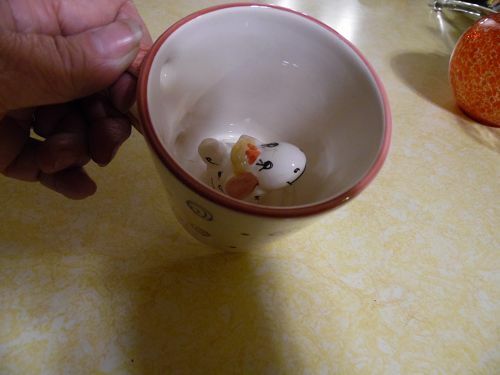 All hand painted ceramic.Inside the mug is a cutle little animal looking upward. It had blck spots, big pink ears and a pink bow. Not sure what kind of animal it was meant to be, but it has a darling expression. I actually have 2 of these but price is for each one. No chips or damages.. Made of glazed ceramic. 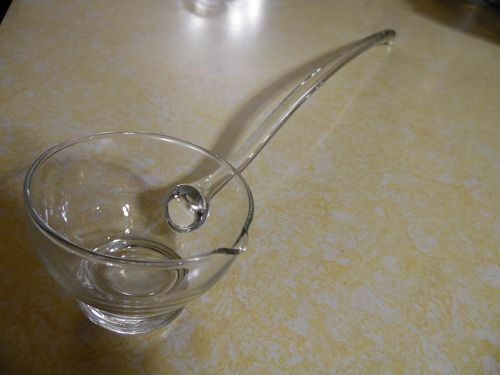 Crystal Punch Bowl ladle, hand blown. Made by Riekes Crisa in Moderno pattern. 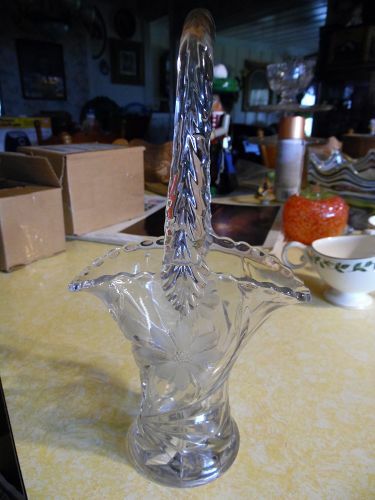 In excellent condition and measures approximately 15” long (tip to tip). 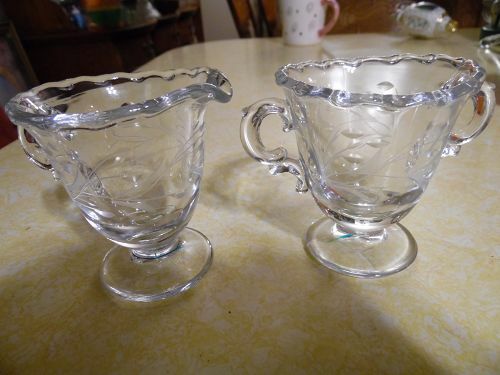 I also have extra punch cups listed in this pattern too. 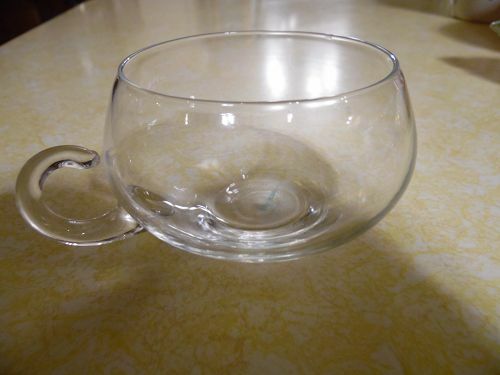 Lovely hand blown punch cups by Riekes Crisa in the Moderno style. Selling individual so you can add to your set. I have 9 available and price is for each cup. All are in pristine condition. Beautiful Christmas ornament by the Bradford Edition,from the Irish Blessings collection. 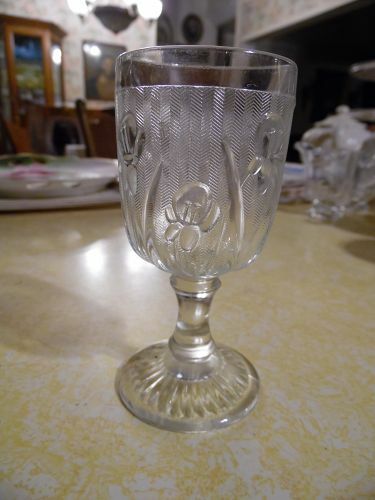 It looks exactly like Irish Belleek with the creamy porcelain with the little shamrocks and basket weave design. Made of fine porcelain and has a pretty picture with the blessing "May the wind be always at your back" Measures 5 1/2" tall with lots of gold trim, and is in pristine condition. No box or paperwork, and appears to have never been used. 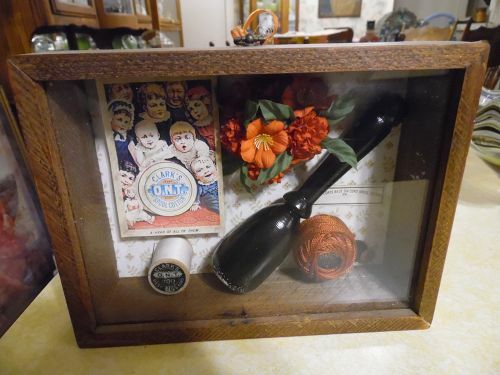 Adorable little shadow box arranged with authentic sewing tools, such as a darner, threads a couple of buttons and a Clark's label. Oak frame appears to be an old drawer. Overall measurement 7 1/2" tall, 9 3/4" wide and 2 3/4" deep. Very nice condition. 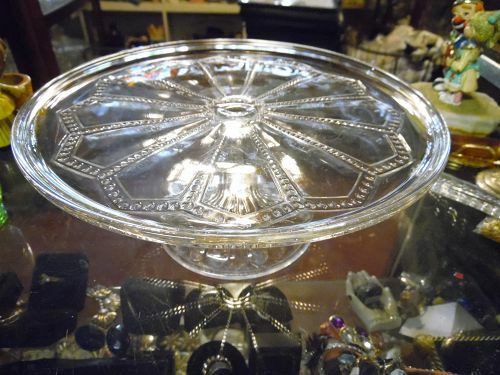 EAPG Beaded Arched panels vintage 1890 cake stand. Unknown maker, 9 5/8" diameter, 3 7/8" tall. No chips or cracks, a few typical straw marks. Lovely little cake plate for use or display. I love using my vintage things for every day.